This is the story of a young girl, Emily, who discovers wisdom in the words of Kato, an old "colored man" who is hired to do odd jobs in her father's drug store. The story, set in 1939, is a chapter out of the author's life. Getting to know Kato, who was born a slave, influenced her life greatly. "The first time she laid eyes on him, Emily Woodson knew that Kato, the old 'colored man' her father had hired to help in his drug store, was someone special. His clothes might be a little shabby, and because of being born a slave, he hadn't had very much schooling, but he turned out to be the wisest man she had ever known. If only she had listened when he warned that vengeance was never worth the harm it caused. Then she and Karen wouldn't have played that stupid trick on Billy Jenkins, even if he did deserve it, or afterward on Darlene Dawson, the most stuck-up girl in their class. Kato had been right, it hadn't been one bit satisfying. Sharing her birthday with Kato had seemed like a good idea, even if Karen didn't understand. Karen was her best friend, but Vinnie could become a close friend too, if things were different. Someday, her father had told her, things would change in this country and choosing a friend would no longer be based on skin color. Then she and Vinnie could be together anytime they wanted without anyone objecting, not even her grandmother." Josie Sikorsky, an eighth grader trying to find herself and rekindle a failing friendship, was once again kicked to the “dungeon,” her basement home when her aunt arrived. The Sikorskys were in for an even bigger surprise this time around, weathering even more of Aunt’s Sophie’s interfering ways than on previous visits. As Josie and Keith, her older brother, devise an intricate scheme to send Aunt Sophie on her way, Josie begins to understand that Aunt Sophie is more than just an irritating nuisance and... well, Keith isn’t really so bad either." 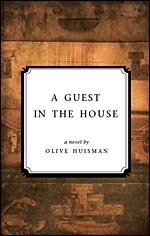 Olive Huisman’s A Guest in the House reminds readers of all ages that though family nuances remain, the treasure of relationships is worth the bother.